This relief is a sculpture salvaged from the building that used to occupy this site, presumably erected in 1951. Since the GPO had moved out in 1829 we wonder if they left behind a local Post Office which got rebuilt in 1951. Alamy have an illustration of "The old Post Office in Lombard Street about 1800" showing it tight up against St Mary Woolnoth. Drawings of this type were often created when it was known that the old building was about to be demolished. 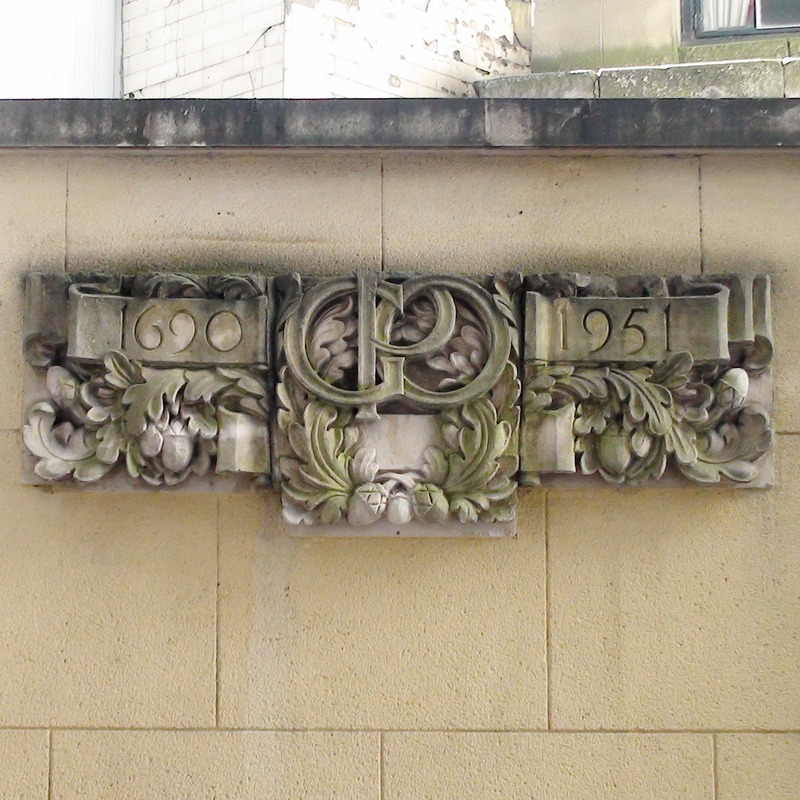 The GPO relief is certainly from a much later building. Getty have an image "late 19th early 20th century" which looks more cotemporaneous with the sculpture but it is very plain with no decorative architectural features visible. There are six other similar carvings attached to this wall, in a group, all of which probably date from the same period. There are monograms on two other pieces: "VR" and "JDCP", the "P" being doubtful. As is the nature with all monograms, the letter sequence is guesswork. Geograph have a photo and quote the City of London: "These sculptures elements were installed here in 2003/4. 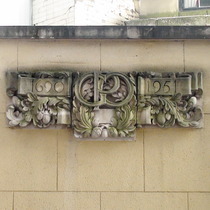 They were decorative elements of the building previously on the site at 10-15 Lombard Street/ 83-36 King William Street and it was a condition of the planning permission to demolish the building and build a new one that this stonework was salvaged and reinstated as part of the development. The stone panels were previously over doors and entrances to passageways across the site. The previous building on the site was a Portland stone clad building constructed in 1938/40, which was designed by Whinney Son and Austin Hall." The GPO piece, at least, surely must be from a building erected no earlier than 1951. Which doesn't match the 1938/40 date. More research needed. The plaque is in this passageway close to the entrance photographed. The sculptures are further in, attached to the wall on the left, the boundary wall with St Mary Woolnoth.